Oct 22 Comments Off on How does an implant work? Chances are, you’ve heard about dental implants vaguely through a television ad or other media, but many patients come to me wondering what they really are and how they work. Although ancient humans attempted to replace teeth with bones, stone, shell, and other materials, modern implants are the result of the accidental discovery in the 1950s that titanium fuses with bone, a process called “osseointegration”, which implant dentistry depends on. Despite the advances in dentistry, it is all too often for many people to lose a tooth due to a cavity that was ignored too long, the failure of an old restoration, fractures, trauma, or periodontal disease. 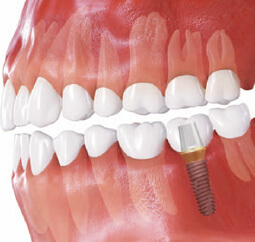 In today’s post, I will discuss the process of replacing a single tooth with a dental implant. I will address full mouth restoration in a future post! Typically, patients seek an implant when they are already missing a tooth. In this case, we begin with a full dental exam and x-rays, and usually proceed to take a 3D CT scan to confirm the width of the bone and proximity of the future implant to sensitive tissue, such as nerves and sinuses. Although an implant cannot develop a cavity, it is essential to establish healthy gums and proper oral hygiene before going through with the procedure. This is because the tissue that supports the implant is subject to a disease called peri-implantitis which can result in the loss of the implant. 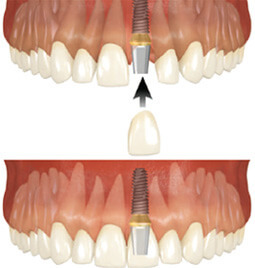 This is also why ongoing care and acheter du cialis en ligne maintenance after implant placement is necessary! Once we have completed the exam and planned for the implant, the initial procedure will be implant placement. This is a minor surgical procedure which can usually be done without IV sedation, although many patients request it. A small incision is made in the gums and the implant is placed directly into the bone. Although this may sound painful, it is actually painless under local anesthesia, and with proper post-op care in a healthy patient, the recover is no worse than a routine tooth extraction. Now that the implant has been placed, we wait about two months for it to “osseointegrate” or fuse with the bone, giving the implant the strength to support a replacement for the missing tooth. The second procedure is quite simple, and, except for rare cases, does not require additional incisions or numbing, just an impression, or “mold” of the implant surface. This allows for an abutment, or metal connector, and a crown to be fabricated in the lab. Although some dentists use pre-fabricated abutments, we usually fabricate custom abutments that provide greater strength for our patients! Two weeks after this appointment, the abutment and crown come back from the lab, at which time we connect them permanently to the implant, and just like that, you have a beautiful, functioning new tooth! The final step is to cement the crown over the abutment. Although this is the basic outline, certain conditions can change the procedure slightly. Areas in which bone is lacking may require grafting, and in cases where the tooth is not yet missing and requires extraction, additional healing time is often required. Although some offices claim to offer same-day implant services, this typically refers to implant-supported dentures, which we will discuss in another blog post. Almost every implant requires at least several weeks before it can be properly restored. As always, thank you for reading and feel free to email me at doctor@wavedentaltx.com with any questions!